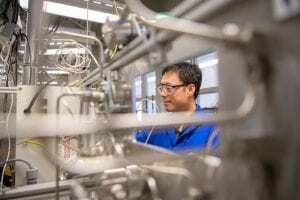 Bingjun Xu, an assistant professor of chemical engineering, is pictured with a tool his research group developed to determine the oxidation state of catalysts. The University of Delaware’s Bingjun Xu has been named to the 2018 Class of Influential Researchers by the journal Industrial & Engineering Chemical Research. He is one of 29 scientists and engineers from eight different countries to make the list.